Is it me, or have the last few months flown by really quickly? 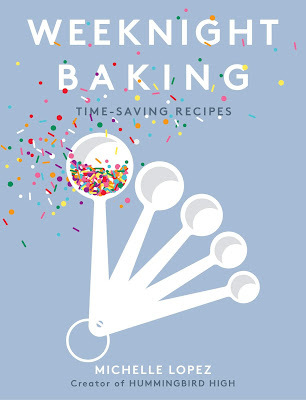 It only seems like yesterday that I got back from my holiday to Turkey with my mom, panicking about all the stuff I needed to do about #weeknightbakingbook. Next thing I know, my manuscript is turned in and I'm just about finishing up the photos for the book. A year seemed to be too much for the work on hand; later, as I locked myself up at Reed College's library to race through the pages of the manuscript, I thought that it was far too little. When I worked in a corporate office, time moved slowly: even with a JIRA board full of tasks on hand, I frequently found myself looking at the clock, willing the time to go by faster. Now that I work for myself, there never seems to be enough time in the day. Days fly by, so packed with items on my "To Do" list that each will feel like a week. My friends with the more typical weekday 9-to-5 schedules make fun of the fact that I never seem to know what day it is — they joke that it's because I don't work, but in reality, it's because I always do. With Portland's summer season officially in high gear, I have to take advantage of all the natural light the summer sun floods into my place (a privilege I rarely get with the 300+ rainy gray days that make up Portland's weather for the rest of the year). Every afternoon is a full blown photo session, and I get up early in the mornings to bake everything I need. Because every day has been the same for the last few months (the constant chipping away at my book to meet my various deadlines), the passage of time is no longer marked by days and dates. Instead, there are other cues that tell me that time is flying by — I've upgraded from spin classes to HIIT classes, with my broken foot making full recovery; Erlend graduated from Columbia and is now finally about to start a new job treating professional athletes; the flavors at Salt and Straw, the ice cream shop around the corner known for their wacky flavors, went from heavy winter flavors like duck crackling with cherry preserves and roasted beets and blue cheese to summer ones centered entirely on berries. If you follow me on Instagram, you'll know that I celebrated #nationalicecreamday with a delivery of some of Salt and Straw's seasonal pints: Goat Cheese Marionberry Habanero, Fresh Sheep's Cheese and Strawberries, and one of my personal favorite Salt and Straw flavors of all time, Birthday Cakes and Blackberries. It's exactly what it sounds like: a pint of ice cream that tastes like frosting, swirled with birthday cake crumble and blackberry jam. So good that I recreated it into this cake you see today. Enjoy! This cake uses a hard-to-find-in-the-USA ingredient: Bird's Custard Powder (which I last used for these rhubarb custard yo-yos). The custard powder gives the cake a dense crumb similar to pound cake and a beautiful sunny yellow color. You can find some at World Market or online at Amazon; in a pinch, you can substitute cornstarch but your cake won't have the same crumb or color as mine. 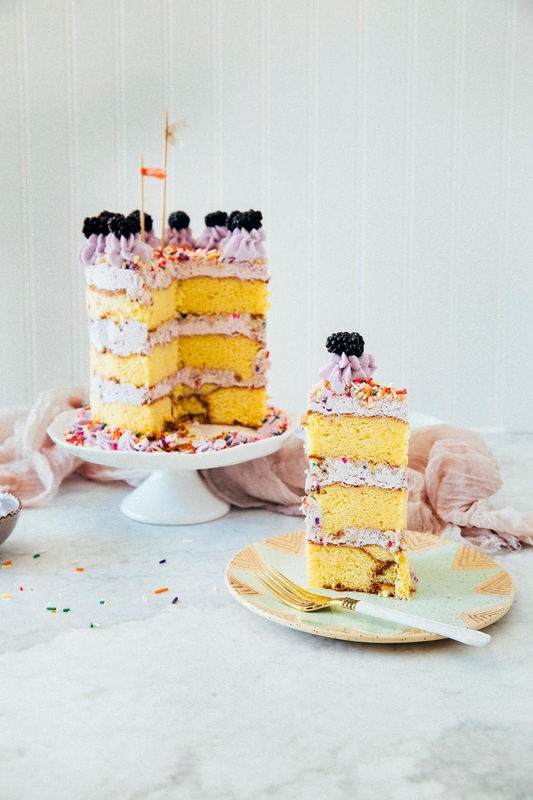 The cake recipe also looks like it uses a lot of egg yolks, but don't worry — save the egg whites for the blackberry swiss meringue buttercream frosting! If you don't want to use that many egg yolks for the cake, you can always substitute with 2 large eggs and 2 large egg yolks. 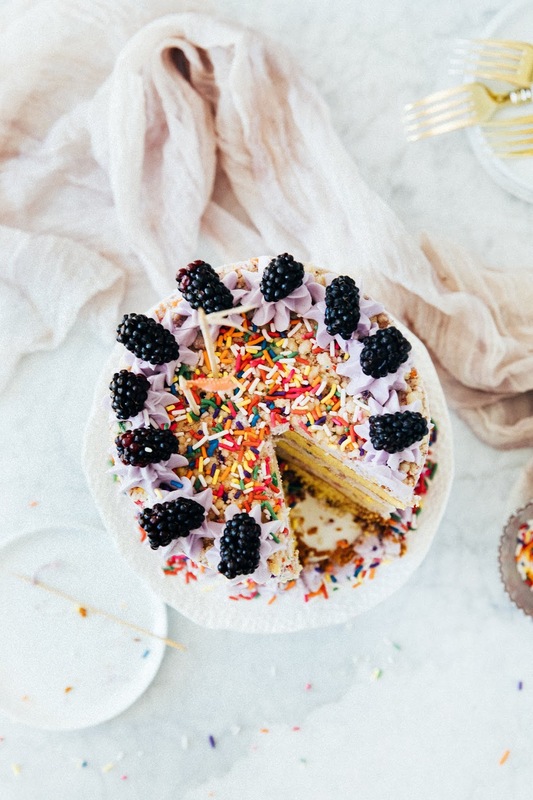 Both the cake, crumbs, and soak use clear fake vanilla extract, which helps give them a classic funfetti flavor; in a pinch, you can use the real stuff and it'll be just fine. In addition to the complicated ingredients, I built this cake using a sorta tricky method: Momofuku Milk Bar's layer cake method, which calls on you to bake the cake in a 9 x 13-inch pan, before using a 6-inch cake ring to stamp out two and a half 6-inch layers and use the ring to build up the stacks. 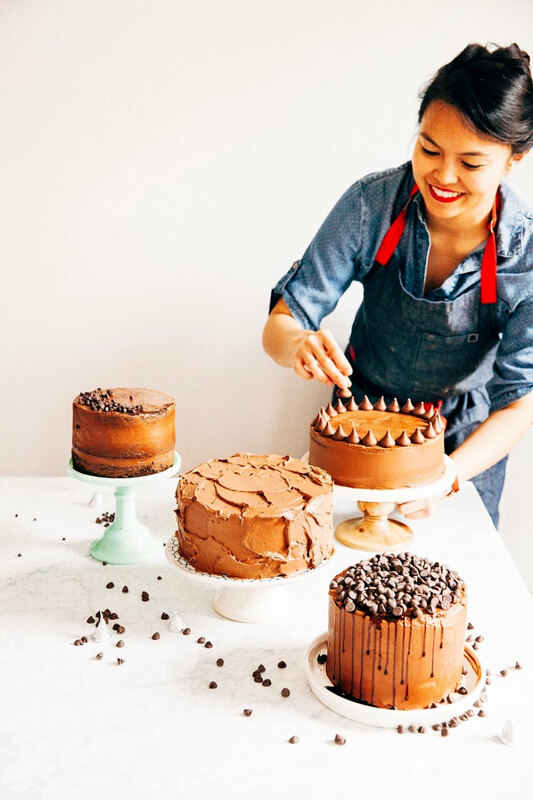 The whole point of the method is to expose the cake layers and different components that go into the cake. For visual photos of the process, I suggest taking a look at my photo guide from yesteryear in which I chronicled the building of Milk Bar's funfetti cake. If you don't want to bother, you can always make the cake recipe in three 8-inch cake pans and go from there. Just know that if you're pinch for time, you can break up the recipe over a few days so that you're making each component on a different day. Both the streusel and the frosting can be made up to 1 week in advance and stored in an airtight container in the fridge. You can always skip the streusel too, but know that it tastes like funfetti and pie crumble combined and is absolutely amazing. When making the Swiss meringue buttercream, it's absolutely important that the blackberry jam and butter are at room temperature: Swiss meringue buttercream is incredibly finnicky, and if some ingredients are colder than others, the frosting will curdle. If you find this happening to your buttercream, eyeball out a 1/4-cup scoop of frosting and microwave for 20 to 30 seconds until soupy. Pour into the buttercream and mix until the buttercream homogenizes once more. Day 1: Make the Birthday Cake Streusel! Center a rack in the oven and preheat to 300 (F). Line a half sheet pan with parchment paper and set aside. In the bowl of a freestanding electric mixer fitted with a paddle attachment, combine 3/4 cup all-purpose flour, 1/2 cup granulated sugar, 2 tablespoons rainbow sprinkles, 1 1/2 tablespoons light brown sugar, 1/2 teaspoon baking powder, and 1/4 teaspoon salt. Mix on low speed until well combined. Add 1/4 cup canola oil and 1 tablespoon clear vanilla extract; continue mixing on low speed until the mixture starts to form small clusters. Use a rubber spatula to transfer the clusters to the lined sheet pan. Bake in the preheated oven for 20 minutes; after 20 minutes, transfer the pan to a wire rack. The crumbs should still be slightly moist to the touch; they will dry and harden as they cool. Use a bench scraper to break the crumbs up into smaller cluster and cool to room temperature completely. Once cool, transfer to an airtight container; the crumbs will keep fresh for 1 week at room temperature or 1 month in the fridge or freezer. Day 2: Make the Yellow Custard Cake! Center a rack in the oven and preheat to 350 (F). Spray a 9 x 13-inch rectangular cake pan with cooking spray and line with parchment paper; spray the parchment paper as well and set aside. In a medium bowl, combine 2 1/2 cups all-purpose flour, 1/4 cup Bird's Custard Powder, 2 teaspoons baking powder, and 1 teaspoon kosher salt. Whisk to combine and set aside. In the bowl of a freestanding electric mixer fitted with a paddle attachment, combine 1 cup unsalted butter and 1 1/2 cups granulated sugar. Beat on medium speed until light and fluffy, around 3 minutes, scraping down the sides of the bowl and the paddle occasionally. Once light and fluffy, reduce the mixer speed to its slowest setting and add 1/2 cup large egg yolks in 3 portions, only adding the next portion when the previous portion below it is fully incorporated. Stop the mixer and scrape down the sides of the bowl and the paddle. Turn the mixer back on to its slowest speed and add 1/4 cup canola oil, mixing until incorporated. With the mixer on low speed, add the dry ingredients (from the 2nd step) in three parts, alternating with 3/4 cup milk and 1 tablespoon clear vanilla extract in two parts, beginning and ending with the dry ingredients. Continue beating just until the dry ingredients have incorporated into the batter; use a rubber spatula to scrape down the sides and bottom of the bowl and pour into the prepared cake pan. Transfer to the oven and bake for 35 to 40 minutes, or until the top of the cake bounces back when gently poked and skewer inserted into the center of the cake comes out with few crumbs. Once done, transfer to a wire rack to cool completely. 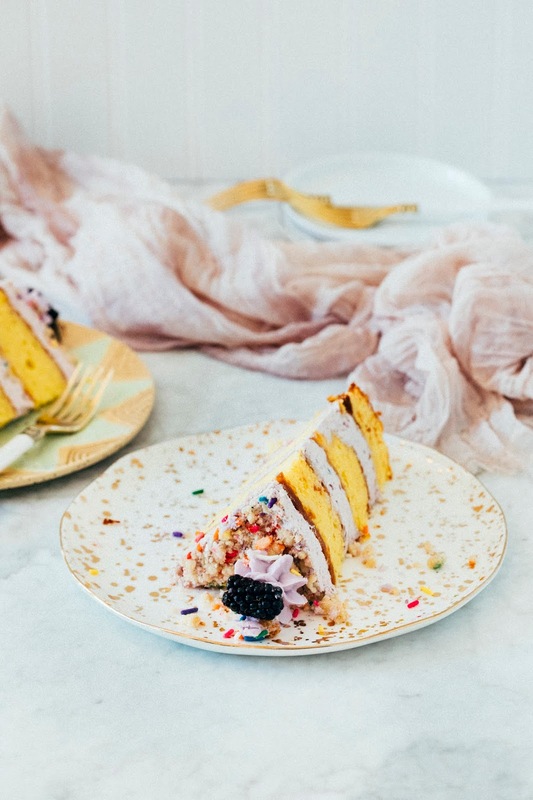 Turn out the cake onto a counter, peel off the parchment paper, and wrap completely in plastic wrap; the cake will keep up to 2 days at room temperature, and up to 1 month in the freezer. Do NOT stick it in the refrigerator — the cake will dry out! Day 3: Make the Blackberry Buttercream, Cake Soak, and Assemble! First, make the blackberry jam. In the bowl of a food processor, combine 1/4 cup fresh blackberries, 1 tablespoon granulated sugar, and a pinch of kosher salt. Puree until combined and transfer to a liquid measuring cup and set aside. Next, make the Swiss meringue buttercream. Combine 1/2 cup large egg whites and 1 cup granulated sugar in the bowl of a freestanding electric mixer fitted with a whisk attachment. Place the bowl in a small saucepot containing an inch or two of water over medium-high heat, ensuring that the bottom of the bowl does NOT touch the water. Cook until the egg whites and sugar reaches 160 (F), whisking the two together constantly while cooking to dissolve the sugar. Once the egg whites and sugar reaches 160 (F), carefully transfer — and BE CAREFUL, the bowl will be really hot! — the bowl back to the stand mixer. Use the stand mixer to hisk the egg white mixture on high speed for 8 to 10 minutes, or until the mixture holds medium-stiff peaks and the mixer bowl has returned to room temperature. No residual heat should be escaping the meringue out of the top of the bowl. Use a rubber spatula to scrape down the whisk attachment, and transfer the whisk attachment for the paddle attachment. With the mixer on low speed, add 1 1/2 cups butter one or two cubes at a time, only adding more butter when the previous cubes have fully incorporated into the mixture. Once all the butter has been added, turn up the mixer speed to medium-high and beat until the buttercream is silky smooth, around 3 to 5 minutes. Once the buttercream is smooth, reduce the mixer speed to its slowest setting and slowly pour in the blackberry jam (from the 1st step). Mix until combined and the frosting is a pale purple color. Transfer to a piping bag with a round tip and set aside. Now it's time to make the cake soak. In a liquid measuring cup, whisk together 1/4 cup milk and 1 teaspoon clear vanilla extract. Set aside. Congrats, you made it to the assembly portion of the cake! This is where you'll need the cake ring and the acetate sheets. Place a large sheet of parchment paper on a work surface. Invert the Yellow Custard Cake onto it and use the cake ring to stamp out 2 circles from the cake. These are your top 2 cake layers. 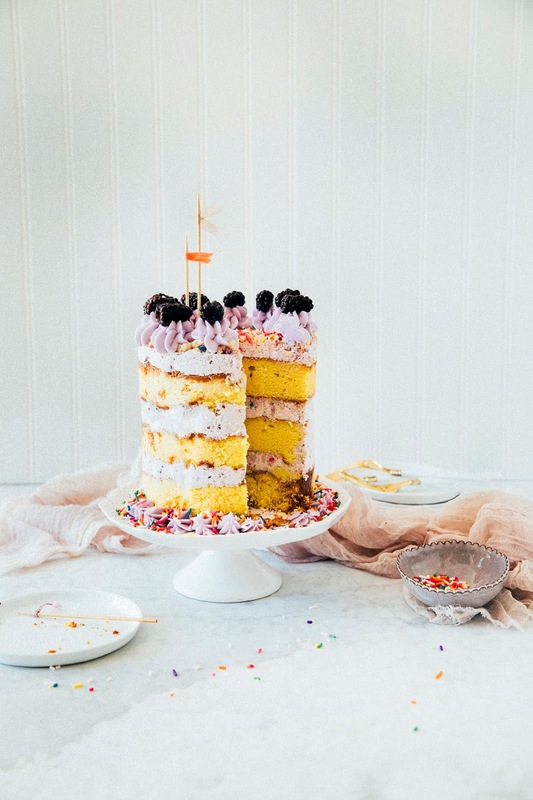 The remaining cake "scraps" will come together to make the bottom layer of the cake — you should still have enough cake leftover to stamp out two half circles. You'll use these half circles for the bottom layer of the cake, and fill the gap between the half circles with the leftover cake scraps. Clean the cake ring and place it on the center of a half sheet pan lined with parchment paper. Line the inside of the cake ring with two sheets of acetate, creating a weird plastic tube that extends upwards beyond the cake ring. Carefully nestle the two cake layer halves into the cake ring, filling the gap between the halves with extra cake scraps to form a complete layer. Don't be afraid to use the back of your hand to tamp the scraps together to create a flat, even layer. Dunk a pastry brush in the Cake Soak and give the layer of cake a good, healthy bath of about 1/3 of the soak. Use the pastry bag of Blackberry Swiss Meringue Buttercream and pipe an even layer of around 1/3 of the frosting across the cake, using the back of a spoon to smooth and even out the frosting as necessary. Sprinkle one-third of the Birthday Cake Streusel evenly over the top of the frosting. Use the back of your hand to anchor them in place. Carefully nestle a second layer of cake on top of the Birthday Cake Streusel. 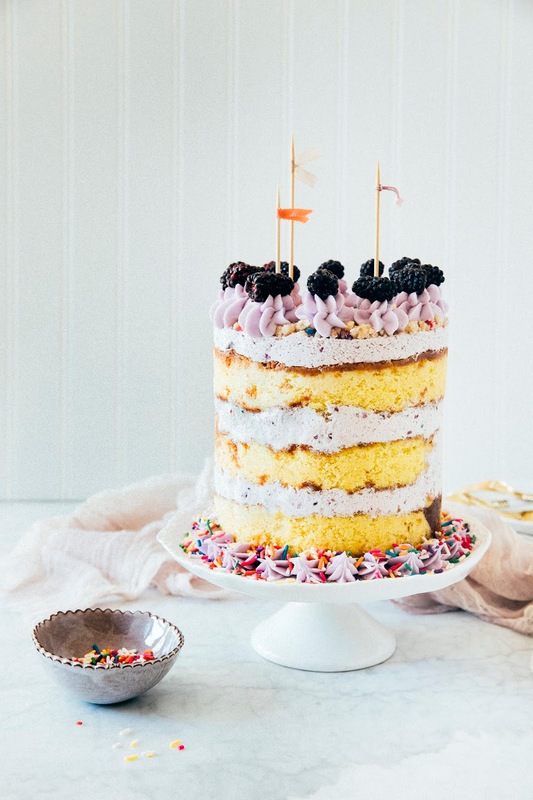 Repeat steps 3, 4 and 5 to soak the layer with Cake Soak and top it with another layer of Blackberry Swiss Meringue Buttercream and Birthday Cake Streusel. Carefully nestle the third and final layer of cake on top of the Birthday Cake Streusel. Repeat steps 3, 4, and 5 to soak the layer with the last of the Cake Soak and top it with the last of the Blackberry Swiss Meringue Buttercream and Birthday Cake Struesel. Transfer the sheet pan containing the cake to the freezer and freeze for a minimum of 12 hours to set the cake and filling. The cake will keep in the freezer for up to 2 weeks. Day 4: Defrost and Serve! 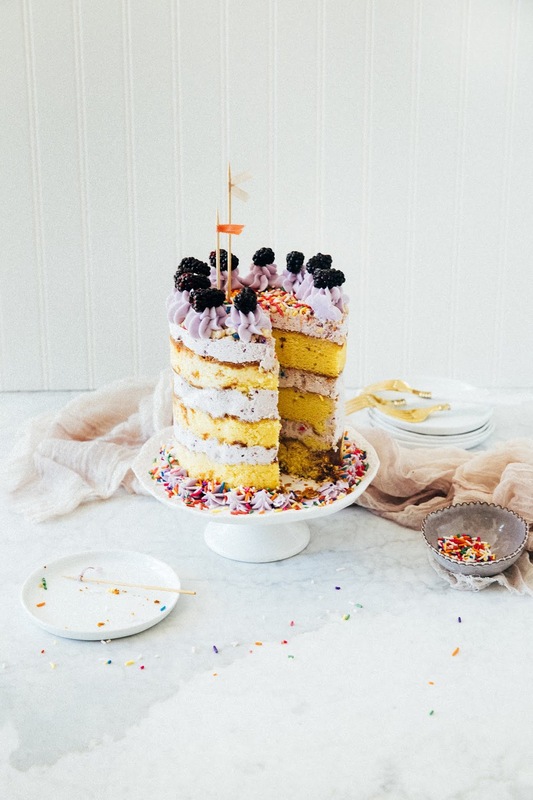 At least 3 hours before you are ready to serve the cake, pull the sheet pan out of the freezer and, using your fingers and thumbs, carefully pop the cake out of the cake ring and transfer to the cake stand or cake plant of your choice. Gently peel off the acetate. Let the cake defrost in the fridge for a minimum of 3 hours, before serving and slicing.